Lakewood Elementary School Grand Opening – Paulsan Construction Inc. The official grand opening of Lakewood Elementary School in Port Dover took place Thursday, Oct. 3 with tours and excitement from the community about the new facilities for their children. Throughout the summer months, Paulsan had been working on a major transformation of a secondary school with Grades 7 and 8 (Port Dover Composite School) to a full elementary school. 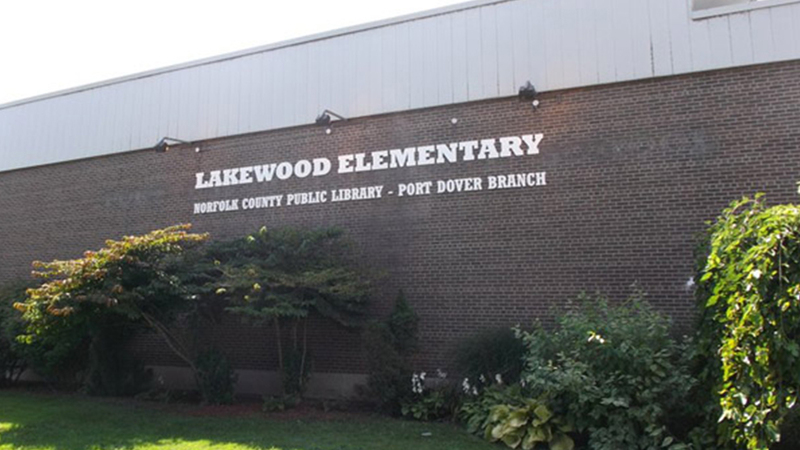 Lakewood Elementary School was ready for first day, Sept 3, 2013, providing classes from JK – Grade 8 all under one roof. Paulsan was the general contractor completing the extensive renovations to the school for the Grand Erie District School Board. The renovations included transforming classrooms (for ex. science rooms into kindergarten classrooms), creating an art room, music room, library, playground, renovating school offices and administration areas, washrooms, and school entrance. The spacious double gym was decorated to a “beach related colour scheme” with sand colour walls, doors and trim in blue with a cloud white ceiling, and floors sanded and refinished. After years of studies and declining enrollment, Port Dover Composite School closed last January for all high school students. Doverwood Public School closed in September, and remains vacant, when the renovated Lakewood opened. The previous high school is now a large, upgraded facility that will be a major benefit for the elementary school children.